Home Permission PowerShell SharePoint SharePoint 2010 SharePoint 2013 SharePoint 2016 Users and Groups How to Add User to SharePoint Group using PowerShell? How to Add User to SharePoint Group using PowerShell? How to add user to group in SharePoint 2013? From SharePoint site, you can follow below steps to add a user to particular group. Go to your SharePoint site and click on Site Settings gear icon >> Select "Site settings"
Click on "People and groups" link under "Users and Permissions"
Click on the SharePoint user group to which you want to add users, such as "Marketing Members"
Click on "New" button >> and select "Add Users". Enter the names of the users to add. Make sure all your entries are resolved. 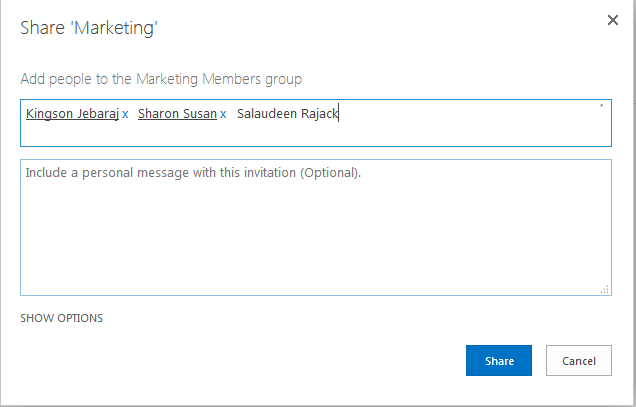 Click on "Share" button to to complete add user to SharePoint group. The users you have entered are now part of the SharePoint group! By default, new users receive an email notification. We can customize the email message text. Also we can choose not to send an email by clicking Show Options and clearing the Send an email invitation check box. There are two cmdlets provided by SharePoint to add user to group using PowerShell. New-SPUser cmdlet adds an existing active directory (or whatever authentication provider) to SharePoint to the appropriate group specified. New-SPUser -UserAlias "domain\user" -Web "http://sharepoint.crescent.com/sites/marketing" -Group "Marketing Owners"
This will create a add a new User to SharePoint site to the particular group. If you execute this command for the next time, (without deleting the user from site collection) this command has no effect! Set-SPUser cmdlet adds an existing SharePoint user to an existing group in the given site. Set-SPUser -Identity "domain\user" -Web "http://sharepoint.crescent.com/sites/marketing" -Group "Marketing Owners"
Other than New-SPUser and Set-SPUser cmdlets, lets use the native object model APIs to add user to group in SharePoint using PowerShell. web.group vs web.sitegroup - SPWeb.Group refers the groups which are used in the specified SPWeb object (If SPWeb uses unique permissions). Whereas SPWeb.SiteGroups refers to a collection of all groups in the site collection. add users to sharepoint library/list in bulk from CSV file?? ?